A garden, or maybe it is even Paradise, is one of the classic themes to be found in Oriental carpets. 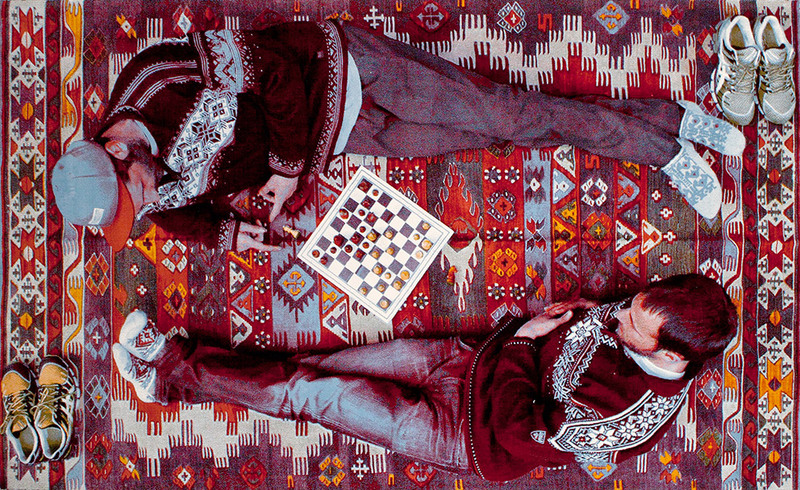 But what does a carpet wish to convey to us that shows a bird’s eye view of two young men reclining, their shoes off, but with baseball caps and pullovers with Norwegian patterns, lounging on an old kilim and playing chess? The two are Veli Silver and Angelos Amos, the one Slovenian, the other Swiss, and for some years now they have engaged in street art the world-over, a discipline where they go by the name of Veli & Amos, more or less parodying show business in the process – and at times even bringing to mind Borat or Die Antwoord. Their main stylistic device is the music video, and these are almost invariably linked to some public interaction or other, often with spraying graffiti or seemingly very nonsensical activities. For example, when they bury a loudspeaker under asphalt in Bolivia, rap “I have no beef” in a field of cannabis, chill out by the pool in the best manner of Southern US HipHop, play around with machine guns or sing “Brand New Reality”. What distinguishes Veli + Amos from consciously leisurely stars and starlets is clear from the carpet, brought out by young Swiss label Schönstaub. The duo’s media self-presentation immediately brings to mind various paparazzi images of Hollywood starlets in baggy track-suit bottoms with coffee-to-go cups or posts by people you vaguely know on Facebook. The carpet likewise captures a fairly irrelevant moment of leisure, but infuses it with meaning, as it has been banished to a valuable carpet. And in the process, making it all the more interesting, any manner of patterns come into play, from the chessboard through the pullovers and sneakers to the carpet on the carpet. Schönstaub will incidentally happily take your own images and weave them into photo-realist carpets for you. Sending the imagination reeling: How about a carpet on which we are busy weeding or taking out the trash? Or with a picture of ourselves waiting for the lights to change or tapping away on a Smartphone? But since, like Veli + Amos, we don’t want to stand accused of narcissism, we simply claim that the path to our own very private Paradise leads through all the side-alleys of everyday life. But remember to take the right patterns along with you.